The finest amplifiers deserve to be paired with superior quality subwoofers and component systems. Thunder4000 subwoofers feature the same ALDS (Asymmetrical Linear Drive System), common to all MTX Audio Thunder subwoofers (the flat progressive spider, combined with the extended, vented pole piece). We've added some other touches to make sure these speakers perform way, way, past your expectations. 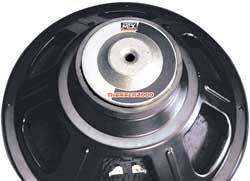 The voice coil is wound on an Apical voice coil former for high power handling. The strontium ferrite magnet yields a highly efficient speaker (more efficient means better use of your amplifier power). The folded window basket is as durable as it is attractive. As important as power handling, so is installation flexibility. Thunder4000 subwoofers are solid performers in virtually any enclosure - vented, bandpass, or small sealed. These subwoofers will please all you fashion plates out there. Machine turned front and back plate with clear zinc plating (that zinc will repel corrosion) and a black foam surround. New injection-molded polystyrene gasket (it looks good, plus it's resistant to those bad UV rays). And the bright nickel connectors are good-looking and functional. Download the 2001 Generation Thunder 4000 Technical Data. T484 8" Subwoofer 4 Ohm 43Hz-150Hz 100/200 87.5dB 1" 20oz. 3 1/2"
T4104 10" Subwoofer 4 Ohm 39Hz-150Hz 200/400 88.0dB 1 1/2" 25oz. 4 13/16"
T4108 10" Subwoofer 8 Ohm 40Hz-150Hz 200/400 88.1dB 1 1/2" 25oz. 4 7/8"
T41012 10" Subwoofer 12 Ohm 40Hz-150Hz 200/400 87.8dB 1 1/2" 25oz. 4 7/8"
T4124 12" Subwoofer 4 Ohm 29Hz-150Hz 200/400 89.8dB 1 1/2" 28oz. 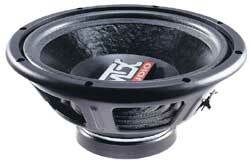 5 7/16"
T4128 12" Subwoofer 8 Ohm 30Hz-150Hz 200/400 90.0dB 1 1/2" 28oz. 5 1/2"
T4154 15" Subwoofer 4 Ohm 27Hz-150Hz 250/500 91.6dB 2" 33oz. 6 5/8"
T4158 15" Subwoofer 8 Ohm 28Hz-150Hz 250/500 92.0dB 2" 33oz. 6 5/8"
T484A 8" Subwoofer 4 Ohms 43 Hz-150 Hz 200 100/200 88.1 dB 1" 20 oz. 3.625"
T4104A 10" Subwoofer 4 Ohms 39 Hz-150 Hz 400 200/400 87.7 dB 1.5" 27 oz. 4.875"
T4108A 10" Subwoofer 8 Ohms 40 Hz-150 Hz 400 200/400 88.3 dB 1.5" 27 oz. 4.875"
T41012A 10" Subwoofer 12 Ohms 40 Hz-150 Hz 400 200/400 88 dB 1.5" 27 oz. 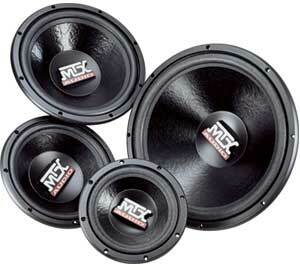 4.875"
T4124A 12" Subwoofer 4 Ohms 29 Hz-150 Hz 400 200/400 89.7 dB 1.5" 30 oz. 5.5"
T4128A 12" Subwoofer 8 Ohms 30 Hz-150 Hz 400 200/400 89.7 dB 1.5" 30 oz. 5.5"
T4154A 15" Subwoofer 4 Ohms 27 Hz-150 Hz 500 250/500 91dB 2" 37 oz. 6.625"
T4158A 15" Subwoofer 8 Ohms 28 Hz-150 Hz 500 250/500 92.2dB 2" 37 oz. 6.625"